Close MSVC if it's open. Copy usertype.dat to <MSVC_dir>\Common\MSDev98\Bin. If there's already a file there, don't overwrite it, just open it and paste the contents at the end of the file instead. Open regedit and go to HKEY_CURRENT_USER\Software\Microsoft\DevStudio\6.0\Text Editor\Tabs/Language Settings\C/C++. If you use .vsh and .fsh for vertex and pixel shaders then add ";fsh;vsh" at the end of the "FileExtensions" entry. If you're lazy you may just double-click the coloring.reg files instead (will overwrite that key though and not just concatenate). 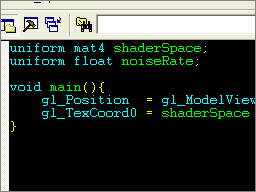 If you have included any shader files into a project already, MSVC will still think it's a normal text file. To solve that problem, just remove them from the project and include them again.